Is your corner of the ‘Verse starting to feel a little bit small? Would you like to make some new friends and take on new challenges? 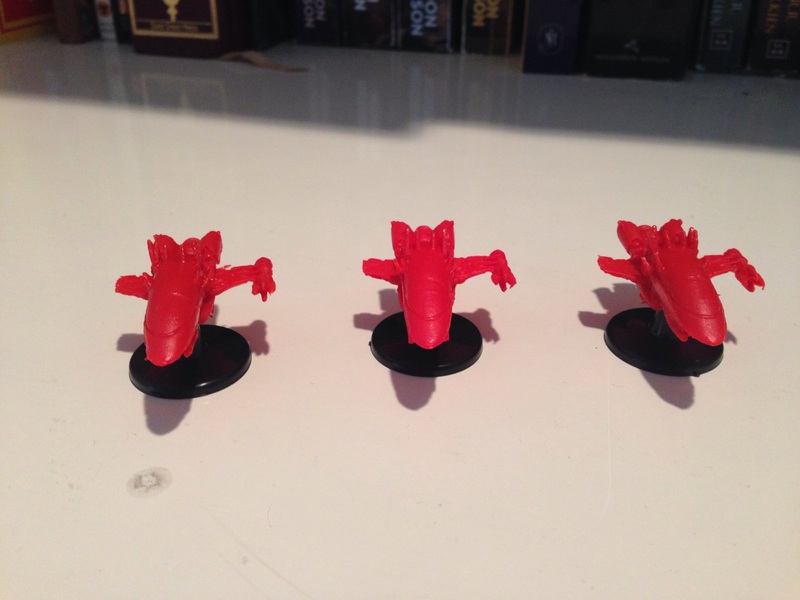 Have you been wanting to bring a little bit of Serenity to your Firefly game and take on the Reavers with a trip out to Miranda? Well, good sir or ma’am, I have just what you are looking for! 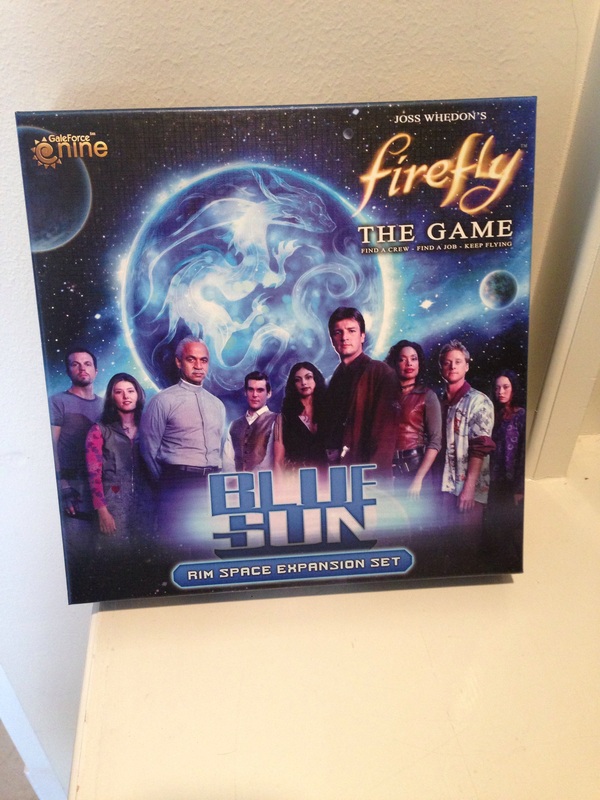 The Blue Sun expansion for Firefly: The Game from GaleForce Nine is here to bring you all of that! 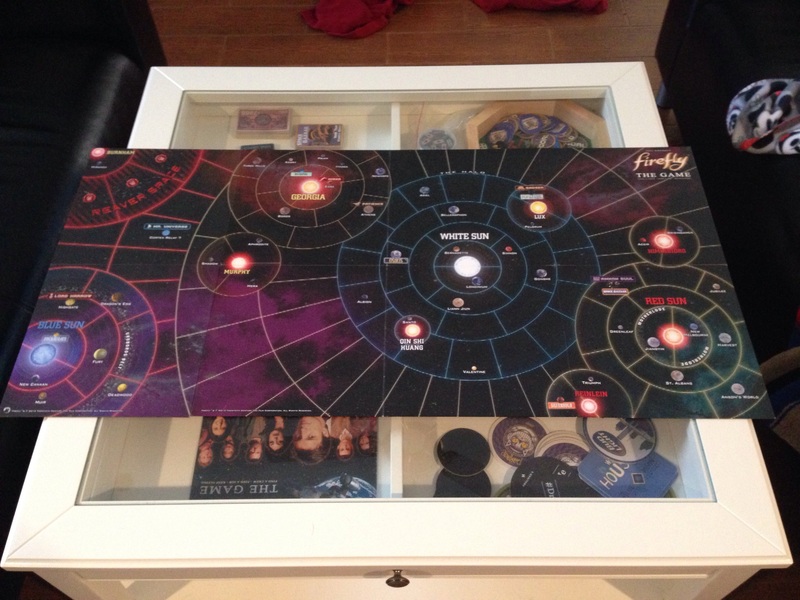 Before I get going on this review I would like to mention that Blue Sun is an expansion to Firefly: The Game, so this review assumes you have at least a basic understanding of the core rules of the base game; a quick overview of those rules can be found in my earlier Review of Firefly: The Game. Blue Sun is the second expansion to Firefly: The Game; The first expansion, Pirates & Bounty Hunters, is not needed to use the Blue Sun expansion but I do recommend using both expansions together as Pirates & Bounty Hunters does add some nice depth and options to the game. If you have read my previous reviews of Firefly: The Game and the Pirates & Bounty Hunters expansion (and why wouldn’t you have read those reviews, they were truly works of literary art!) you know that I am a big fan of this game. This expansion doesn’t make any major modifications to the game, it really just expands upon what is already there. It also brings in elements from the movie Serenity into the game for the first time. 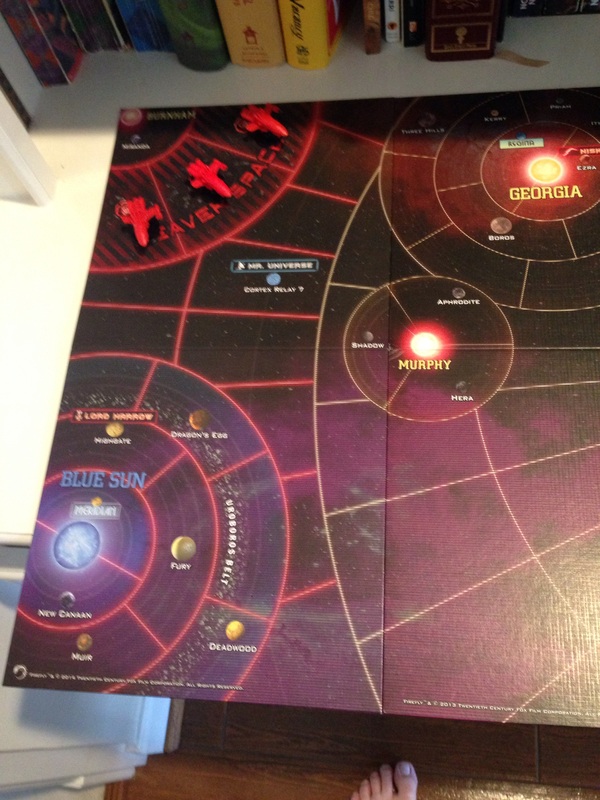 The first way Blue Sun expands the game is that it expands the board by adding in the new Rim Space section to the board. This extension to the board makes it so that your ‘Verse will now be over three feet wide! 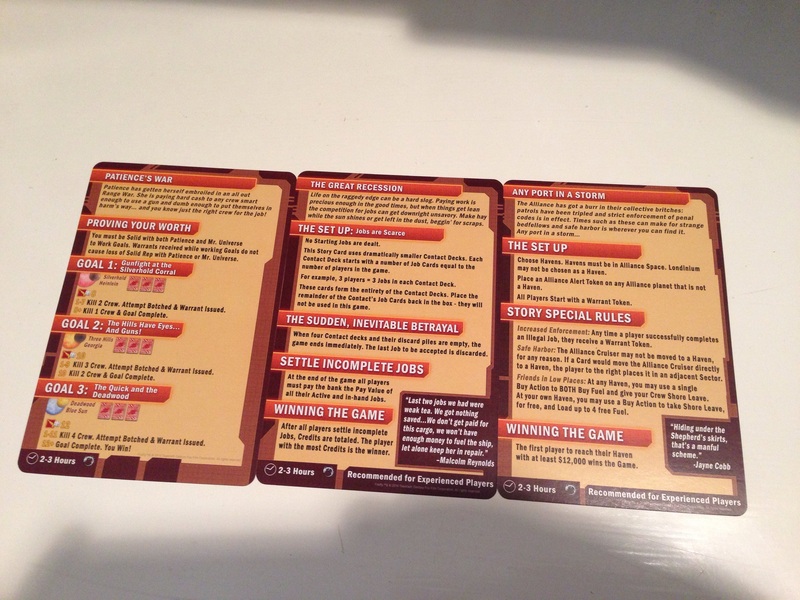 And of course more board means another movement deck! 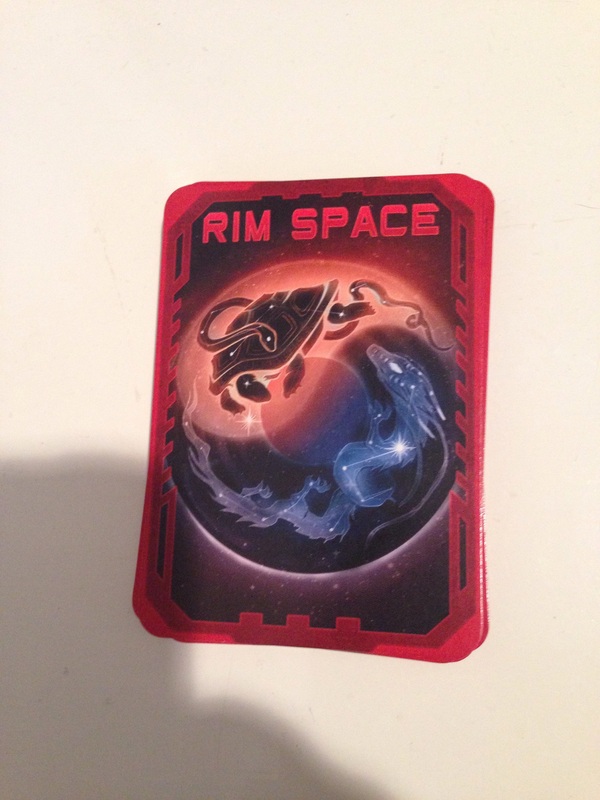 The new Rim Space deck has even more events than the Board Space Deck as you’re out towards the fringes of civilization. But with the increased danger there are some great benefits as well–some even better salvage ops than in Boarder Space, a chance to pick up a new crew member for free, and even ways to boost your movement through crazy grav well maneuvers! Also way out in Rim Space is the new supply planet, Meridian. While this new planet is more than a little bit off the beaten path, it does have some great new and powerful items and characters. I have a few of my favorites shown here–now you can kit Mal with his signature coat and pistol! I love using Cortland’s “Laws are for the Poor” ability; it’s so satisfying to just throw money at your problems to make them go away! 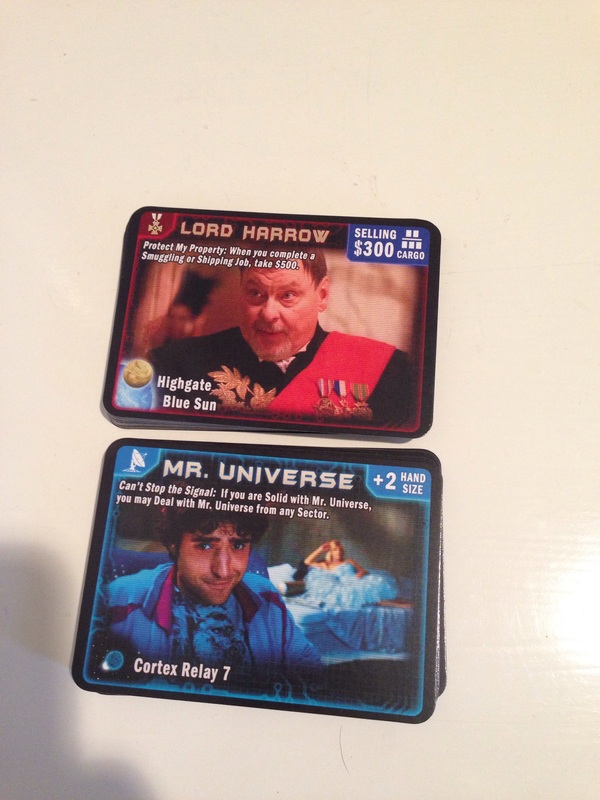 Out in Rim Space you will also find two new contact–Lord Harrow and Mr. Universe! Lord Harrow works like the other existing contacts; when you are solid with him he gives you the benefit of extra cash when you turn in shipping or smuggling jobs and you can actually buy cargo from him to make up for cargo you have lost or to sell to other contacts for a profit. Jobs for Mr. Universe work a little bit differently from normal jobs in that you add them on to another job when you start it to make it a little bit harder to complete but gives you extra rewards if you complete it with the extra challenges. Being solid with Mr. Universe increases your hand size of inactive jobs and allows you to deal with him from anywhere in the ‘Verse because you can’t stop the signal! Blue Sun also adds in jobs to old contact decks to get you out to Rim Space. An interesting twist that several of these new jobs have (particularly the ones that send you to Miranda) is that they allow you to load more goods than you need to deliver, allowing you to pick up a bunch of extra cargo or contraband to sell to contacts and make even more money off of the job. 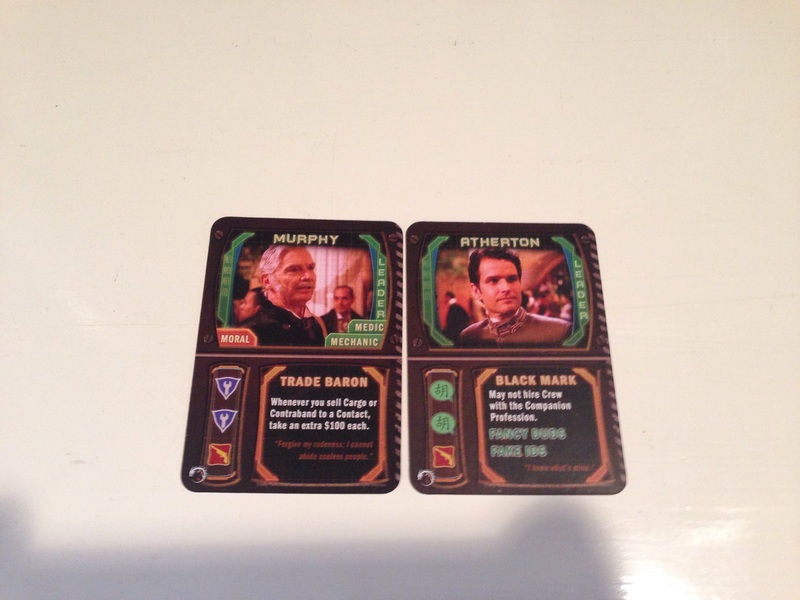 Also added in are two new captains who you should recognize from one of my favorite episodes of Firefly–Shindig! 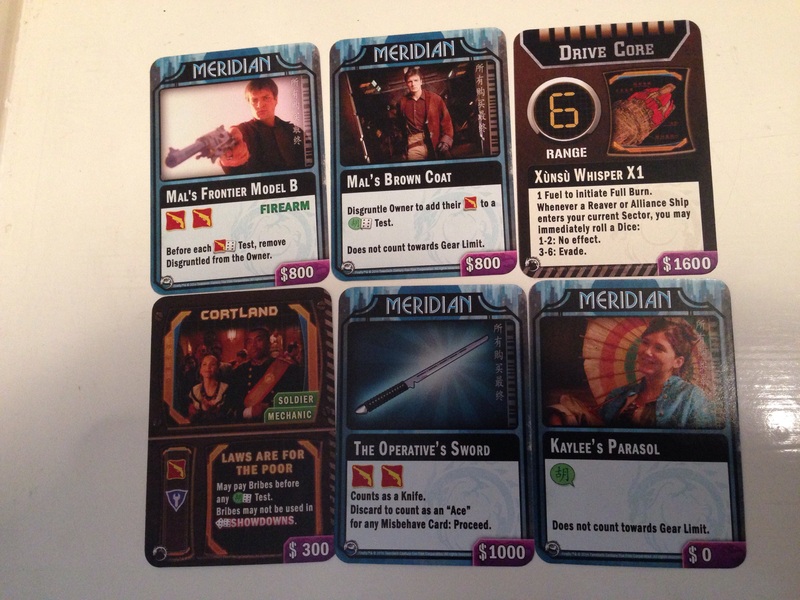 The biggest change that Blue Sun makes to the game-play of Firefly: The Game is that it makes the Reavers a much larger threat in the game; if you have played Firefly several times, you know that there can be entire games where the Reavers aren’t a factor at all. Blue Sun changed this with some minor, yet elegantly effective changes to the rules for the ways the Reavers operate. The first and most obvious change is that there are now three Reaver ships and whose ever turn it is to move the Reavers gets to choose which one of the ships they will be moving. Also when Reavers move, they leave behind alert tokens (we call them Reaver poop because we clearly we are too immature to actually be considered adults). 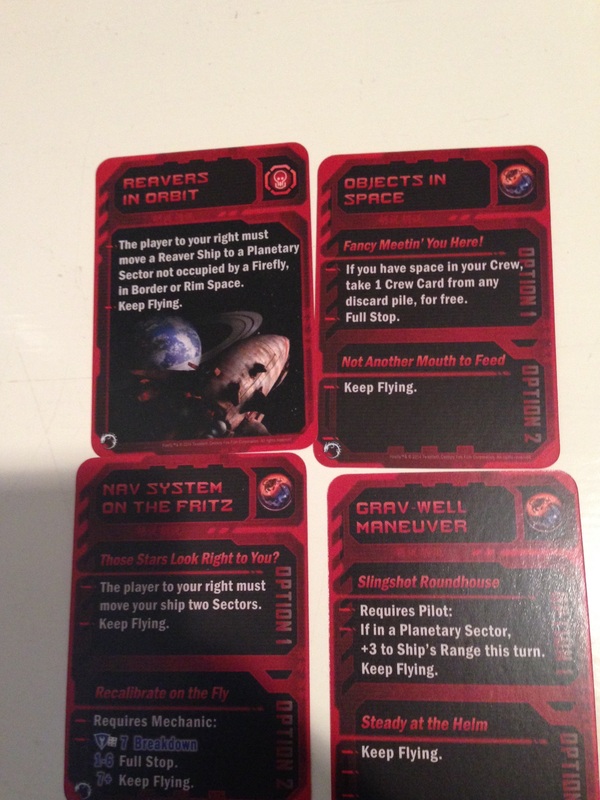 These tokens make places the Reavers have been more dangerous because they might return at any moment–when a ship flies into a sector with Reaver alert tokens in it they must roll above the number of tokens present or a Reaver ship immediately jumps to that sector! If those changes to the Reavers weren’t scary enough, Blue Sun updates the Border Space navigation deck by replacing the Reaver cards. 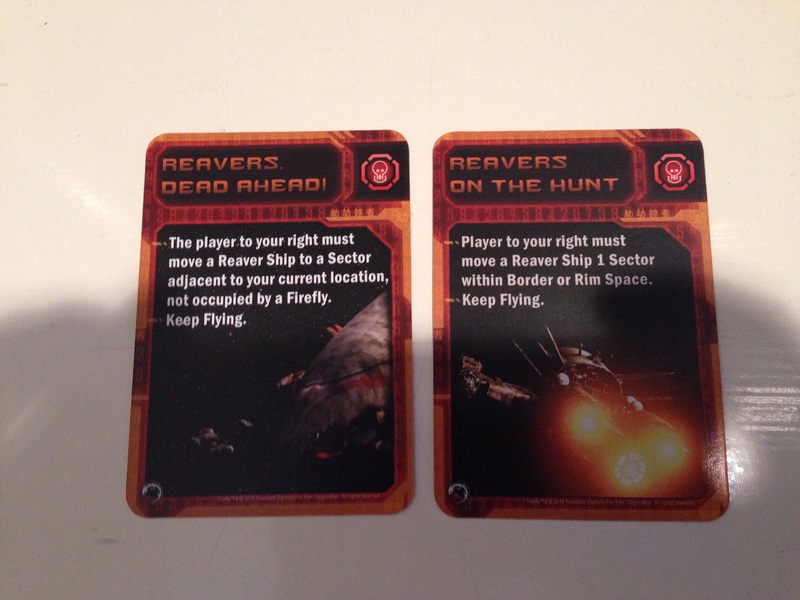 Not only do these update the wording on the Reaver cards to refer to the choice of Reaver ships now available, but they also add in dreaded “Reavers Dead Ahead!” cards. Instead of a Reaver ship just being moved one sector, the player moving the Reaver ship gets to place it in an unoccupied sector adjacent to the active players ship! This gets the Reaver ships right into the midst of the players early and keeps them a constant threat. Blue Sun adds in a few more missions that bring in the new areas and aspects of the game. Two of these new scenarios are also more tailored towards giving experienced players a challenge. The Blue Sun expansion adds some more depth to the game and makes the universe feel a lot bigger. In most games we tend to end up going out to Rim Space only once or twice, but those trips can make a huge difference in the game, especially in the scenarios where you are trying to make the most money. 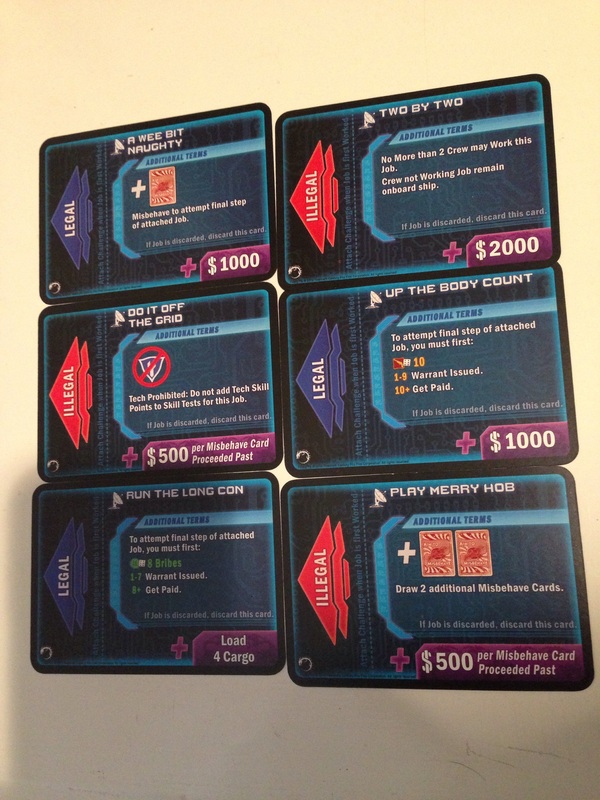 The new scenarios add more variety to the games you are going to play; the Great Recession Scenario adds a really fun twist by limiting the number of jobs available and then triggering the end game once a certain number of the contacts decks are empty. It’s really nice to see elements from Serenity finally in game. I had thought they would add some into the game in the initial release or in Pirates & Bounty Hunters, but as the source material for this game is limited it does make sense to eke it out a little. There certainly are plenty of elements that could be added in to this game, so I am hoping that GaleForce Nine brings out another expansion at Gen Con this year. 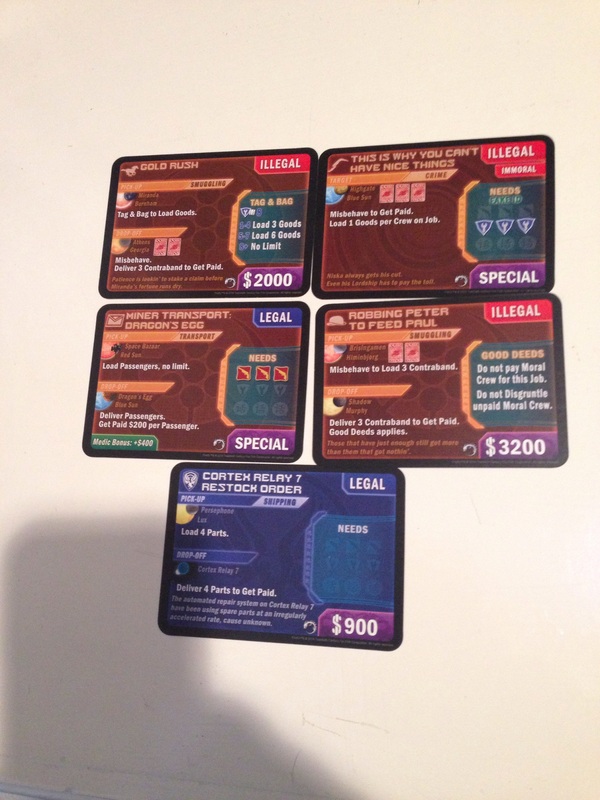 My favorite part of the Blue Sun expansion is the changes that were made in the rules for the Reavers. Previously the Reavers didn’t really take that much of a part in the game other than occasionally popping up to ruin your day; having the Reavers be in amongst everyone much sooner makes them a much bigger factor in the game. It also makes being ready to escape the Reavers a much more important consideration for players, which in turn makes the Reaver reshuffle card feel less sporadic and awful when you get hit by the Reavers that way. I really enjoy this expansion, but it left me wanting a little bit more. The changes in the Reavers dramatically affect the game for the better and are the best part of this expansion. Adding in the new supply planet and two new job contacts are nice, but their implementation could have been a little bit better. 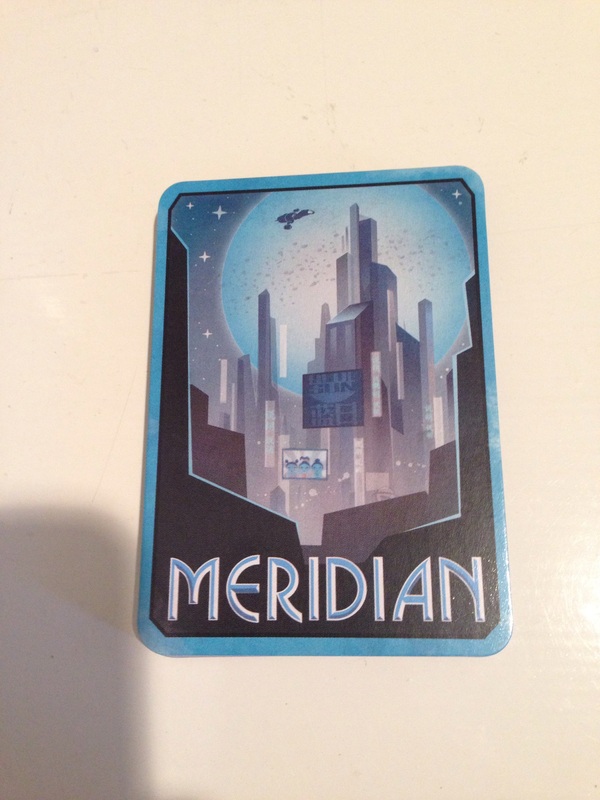 Lord Harrow and Meridian are on adjacent planets as opposed to being on the same planet; both are rather far out from the rest of the ‘Verse and it’s quite annoying that you can’t shop at Meridian and deal with Harrow on the same turn considering how long it takes to get out to them. While the idea behind jobs for Mr. Universe adding on to other jobs is cool in concept, they don’t tend to get used all that often. I was also disappointed that Blue Sun didn’t add in any new ships for you to captain. I would like to see more ships with different capabilities available to add a little more flavor to the game. After the amazing core game and great first expansion Blue Sun was a bit of a let down by comparison, but it was still well done. I do recommend picking up the Blue Sun expansion for Firefly: The Game, but if you absolutely must choose between getting this expansion or the first expansion I recommend getting Pirates & Bounty Hunters. I give this expansion 3.5 out of 5 stars. And now for some delightful bonus coverage! A little while back GaleForce Nine released the Artful Dodger booster. 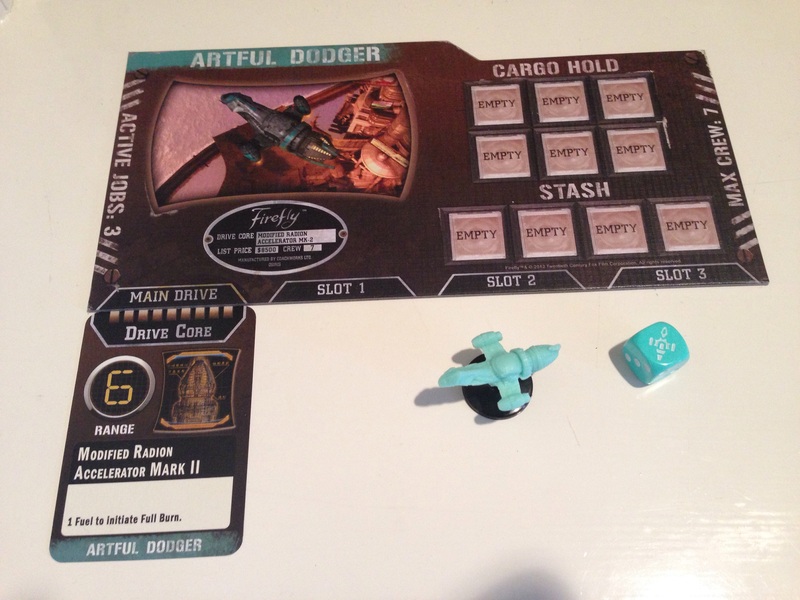 This booster contains a ship card for the Artful Dodger, a ship game piece, the starting Drive Core for the Artful Dodger, and a custom die to match the ship game piece. 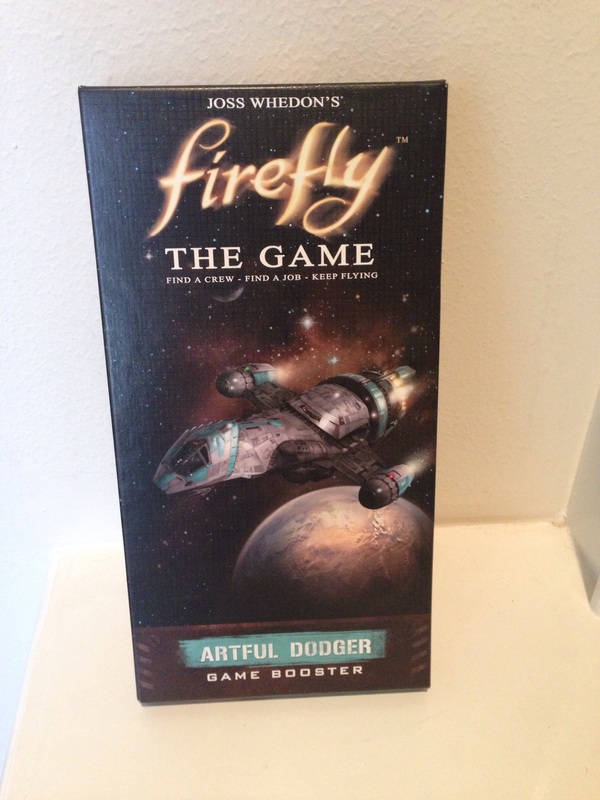 At Gen Con I played an organized game of Firefly with the Pirates & Bounty Hunters expansion and the winner got a copy of the Artful Dodger booster. I managed to pull off a victory by the skin of my teeth and after months of waiting, this nifty little ship finally showed up in my mailbox! This ship certainly isn’t anything gamebreaking, but having that extra range and crew capacity can be quite handy some times and those benefits do come at the cost of cargo space. Unfortunately the Artful Dodger no longer appears to be available on the GaleForce Nine webstore, but I have seen a few copies of it available in at least two of the friendly local game stores I frequent. Due to the Artful Dodger’s limited availability I strongly recommend that you pick this booster up if you happen to see a copy of it available in your FLGS. This gives me hope that GaleForce Nine might bring out other ship boosters at some point, although I have currently heard no word as to if they are bringing out any new boosters or expansions for this game any time soon. If you have heard anything about either, let me know!